Ecologist at International Avian Research and Research Associate at Hawk Mountain Sanctuary. The Egyptian vulture (Neophron percnopterus) is globally endangered; it has, like so many other vulture species, declined as a breeder across its range, which extends from central Europe and Asia to Africa. The causes for its decline are varied, including (amongst other things) accidental and targeted poisoning, persecution, disturbance, decline of food availability, electrocution, and use of body parts for traditional “medicine”. Adult Egyptian vulture near the abattoir at Tadjoure. species, that can be aged in the field from plumage characteristics. Birds that breed in the northern part of the distribution and their young migrate to Africa, Arabia and maybe India. It appears that immature birds (< 4 years of age) spend the years prior to maturation in southern parts of their distribution. In other words, young birds do not generally migrate back to more northerly parts of their breeding range in Asia and Europe. Hawk Mountain teamed with us and made available a solar powered, GPS satellite transmitter (a.k.a. GPS PTT or sat tag) to fit to an Egyptian vulture. 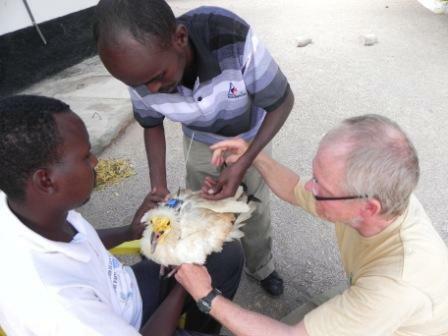 So, on 11 March we captured an adult Egyptian vulture (“Assamo”) and fitted it with the sat tag. Since then it has been wandering around north central Djibouti. In the coming weeks, months and hopefully years, we will be regularly posting maps (hopefully about every 10 – 14 days) of Assamo’s movements on this blog and on the Djibouti Egyptian Vulture blog, and discussing what is happening with the bird and with Egyptian vultures, in general. 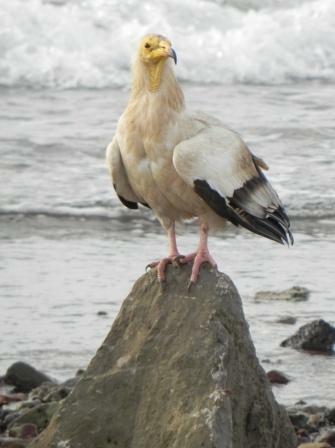 Please visit the Vulture Chronicles every so often or the Djibouti Egyptian Vulture blog to keep up with Assamo, and comment on his activities or about vulture or Egyptian vulture biology, ecology or conservation. 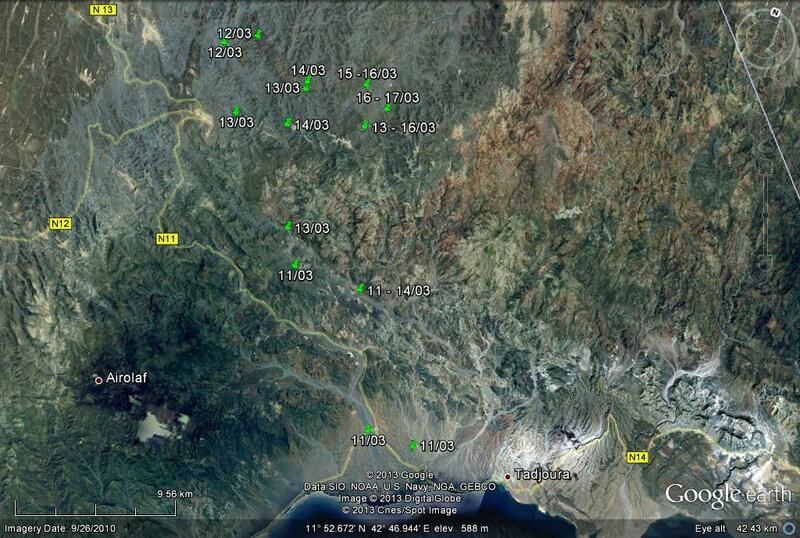 Below is a somewhat dumbed-down map of what Assamo was doing between being captured and 17 March. I say that the map is dumbed-down because I have removed many of the actual locations of the bird where they were part of a cluster, and then I re-labelled the location with the date or range of dates when Assamo was there. This has resulted in a “cleaner” map that I hope will be easier to follow. Movement of Assamo during 11 – 17 March, immediately after release. What is shown in this initial map is that Assamo has not migrated (yet), and so may be part of a resident population. He (or she… we can’t tell) has been moving within about 60 km of where he was caught, and been moving between scattered locations, sometimes revisiting locations after a gap of some days or hours.